It's been suggested that if all animal species were allowed to vote as to whether humans will be allowed to continue on Earth, we would be voted to extermination. The other sentient beings we share the planet with may not be supportive of our ways. There are the bankers who rob the public trust and the industries that are killing our planet for profits. There are the lawyers and the HMOs that corrupt our justice and health systems. Then, of course, there is the political scene. Can an honest person get elected? It's a rhetorical question - better to go to the source and ask the lobbyists for industry, PACs and other special interest groups. There are the marketing messages that flood our lives daily to slick up the truth about products or services. It was reported recently in the Huffington Post that a man actually sued Anheuser-Busch because the poor guy found that he was still not surrounded by beautiful women in a tropical setting despite having consumed copious quantities of Bud Light. The very fact that we think it is ridiculous to take such marketing seriously demonstrates the mental filters we've developed to cope with the situation. Yes, we are certainly bombarded with less than full integrity by marketing campaigns to the point that we've become so numb that it only reaches us through the subconscious. And so, the messages are carefully engineered to reach us in that way. It's time to clean up our act. I wrote about some of my personal stories around integrity and their personal impact last month - see "Stories: Good (and Not-So-Good) Vibrations". 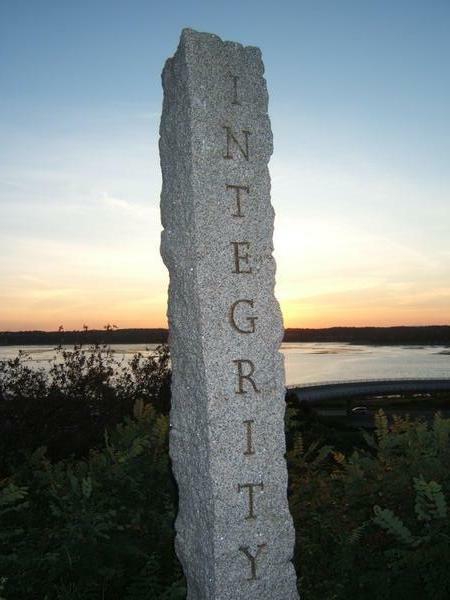 I'm interested now in examining the role of integrity in our lives without demonizing or blaming anyone. Simply, is it possible for a large, diverse society to live in full integrity? How might such a society be constructed? Despite the bleak message from the examples chosen above, there is a renewed interest in integrity by individuals and within businesses and other organizations. One problem that comes up quickly in a discussion is defining a subjective quality such as integrity. 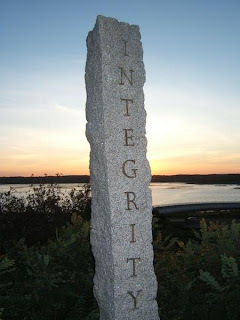 Is my integrity your integrity? Right is different things to different people. Many progressive thinkers seem to agree that right and wrong are man-made concepts constructed from religious or tribal beliefs and therefore vary between and within cultures. In a Taoist sense, right and wrong are dualistic manifestations of the mind. Hmmmm, integrity seems difficult to envision on a large scale if we have difficulty simply defining it universally. But, integrity is like art -- one knows it when one sees it. That simplifies it. Perhaps we can build integrity by managing our desires and aversions. That sounds rather "Buddhist" -- someone must have thought of this before. We can take it further. Desires and aversions are run by ego. The ego has lots of desires around wanting to be distinctive and avoiding anything unpleasant. Now it's beginning to make sense. Ego is at the root of desires and aversions, which in turn are at the root of breaches of integrity. Perhaps, we don't need to concern ourselves with defining integrity. We can look at the root of the tree to predict what fruit it might bear. Enlightenment is sometimes described as an ego-less state. Our egos filter the information we receive and manipulates the data to serve its own existence before presenting it to our conscious mind. Illusion is the product of ego and few people have been able to pierce its veil. Out of the illusion comes greed and excess, fears and insecurity -- desires that the mind can not distinguish from needs and fears that the mind equates with danger. Integrity can easily be overshadowed by what the mind perceives to be something more important. So, integrity will be present in the enlightened ego-less state and it will be breached more frequently and harshly within the domains of fear and greed. It seems, therefore, difficult to imagine a large society living in full integrity as long as fear and greed permeate the culture. Thus, to answer my own question, it doesn't seem likely that Earth's human race will be living in full integrity anytime soon. The long-term strategy would then seem to be to work towards building an enlightened society. While we're in that process, simply notice, be aware, and try to protect oneself as best one can - paying heed to the warning indicators. Don't expect integrity among those who strive for material wealth, those who embrace the ego or those who are fearful. Find it more abundantly in the stillness of the unmanifested. Look beyond the illusions and integrity will be revealed. Love is the Manifester - the creator of all things lasting. Love is the Sustainer - nutrition for the soul. Love is the Transformer - the power of the healer. Love reveals - seek consciously and learn. 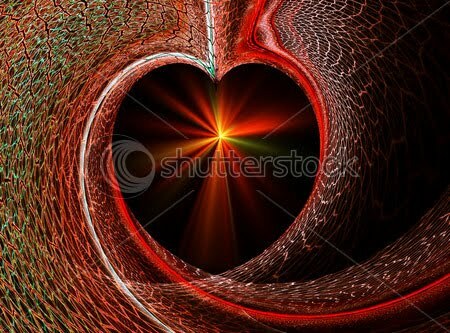 Sages and theologians have pointed to love as the ultimate power. Some say, "God is love." The songs we listen to and the poetry and novels we read exalt love. It's easy to overlook because it is so common. Permutations are everywhere - we seem to be bathing in a plastic vat of it. I've learned to tune love out for many situations in my life. Much of it seems adulterated, veiled or manipulative. I'm careful about what I let in and what I let out. I have a mental image of a brilliantly glowing light-furnace in my chest that is encased in a volcanic rock-like crust. I want some chosen few to see it and share its warmth in some carefully constrained way - it's been hidden from others. I've wondered why. Love can be misguided, abused and perceived as weakness. And, of course, there is the heartache that might lead one to reject it. Yet, I think my own turn from love started very early. I remember walking with my mother to my first day of kindergarten. As we approached the school, I turned and calmly informed her that she could go home. "I don't need you anymore." It was the early rejection of mother love - the separation, the strengthening of me as a discrete being. The nice thing about mother love is that it continues to radiate in the face of adversity. In fact, Mother Love is one of the most powerful forces in the universe. It's a force we can all tap into whether or not you're a mother. You don't have to get it from anyone else, though it's certainly nice to receive. But, love dissolves ego and ego rebels. The egoic rebellion -- the desire to separate and be special. Love works to bring beings together -- that can feel challenging or threatening for the unrefined ego. It makes one vulnerable. So love gets compartmentalized - saved for a few who are trusted. One can sort of fake it for the rest. Boys, particularly, are often conditioned to be tough. Love becomes a weakness. It's hard to be competitive when you love your competitor. It's hard to win when it means someone you love will lose. It's hard to be better when others you love are then worse by comparison. It's hard to look cool when you love your mother. It's hard to make soldiers out of young men who are filled with love. So many of us were hardened. Society showed us the way and we learned how to shelve love in order to compete, get things done, or fight for our country. Our world is paying for this. Realizations surface around love in my meditations. There's a powerful magic here - the most profound that I have encountered. It's something that has been right in front of me all my life though I failed to grasp its significance. What I primarily wanted to do at this time is pass on the realization that there is a pure love (more than one, actually) and it empowers the manifester, the transformer, and the healer. It's similar to an energy field and it's real rather than abstract. You can tune your mind/body to it and direct it. You can receive it and transmit it. It's something you might want to contemplate for yourself. Tune in to receive love and let it radiate from you to others. Align consciousness with it, manifest with it, transform with it, heal with it and, importantly, don't abuse it.